Advantages: Includes historical and operational summary of this important Luftwaffe type in the airliner, transport and training roles; large, well reproduced photos; German/English text; attractive profiles. The Focke-Wulf Fw 200 Condor was originally designed to a specification set by Lufthansa for a commercial airliner. This all-metal, four engined monoplane first flew in 1937, and soon set a number of endurance records including the first ever non-stop flight between Berlin and New York. With war looming, the Condor was adapted to military use by the lengthening of the fuselage, installation of defensive gun turrets and the addition of wing hard points for ordnance. The sleek Condor fulfilled many roles during WWII, including transport, anti-shipping and training. As the title specifies, this first volume from Air DOC on the Condor focuses on airline service, transport & training. The book commences with a bilingual text summary of the international pre-war environment under which the Condor operated, especially the delicate commercial and political relationship with the USA, and the important early trans-Atlantic flights. This is followed by a description of transport, liaison and reconnaissance operations from 1939 to 1945. A table lists variants, werknummern, names and other details of all Condors that fulfilled these roles. The focus of this title, however, is the photos. These are well reproduced and pleasingly large with plenty of useful detail on display. I have not seen many of these photos published elsewhere either. All photos are accompanied by useful captions in both German and English. A good selection of photos has been chosen, with a combination of colourful pre-war schemes and camouflaged Condors, including Hitler's personal transports. Even more interest is added to the book via eight colour profiles, including one helpful four-view illustration. 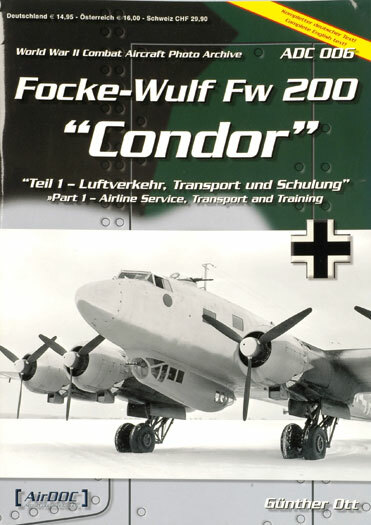 "Focke-Wulf Fw 200 Condor Part 1 - Airline Service, Transport & Training" is an compact modeller's reference for this graceful Luftwaffe aircraft. The timing is good too, with the excellent Revell kit in 1/72 scale plus Trumpeter's offering in 1/48.